For adults, Christmas is when we reflect. A time for nostalgia. It’s the season where we glance back at previous years and try to recreate in the present what made the ones in the past seem so magical and exciting. 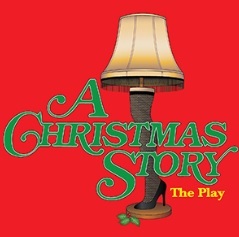 When film director Bob Clark adapted the short stories of satirist and radio personality Jean Shepherd, combined them into a screenplay and made the 1983 film A Christmas Story, he tapped into the average American family nostalgic factor in a way no other film had previously achieved. 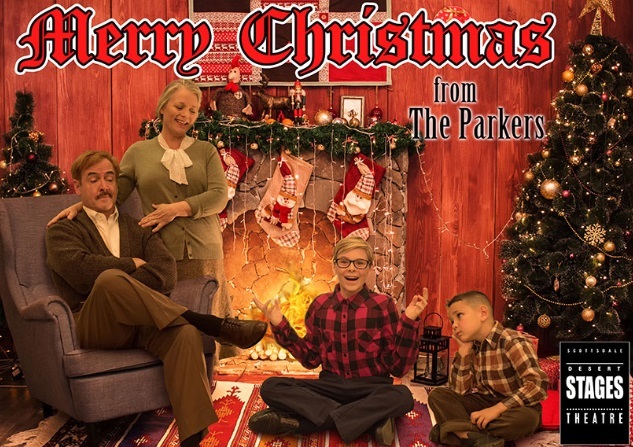 Little wonder the story of the Parkers from fictional Hohman, Indiana has become such a seasonal classic. 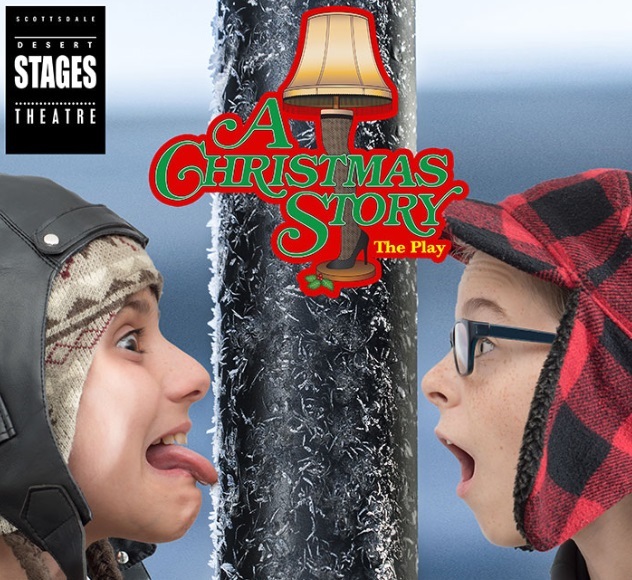 With its 1940s, mid-western setting, A Christmas Story is the way we like to remember a family Christmas, even if we never really experienced it in quite the way the story suggests. The success of the piece is that it makes us believe that’s how it was. 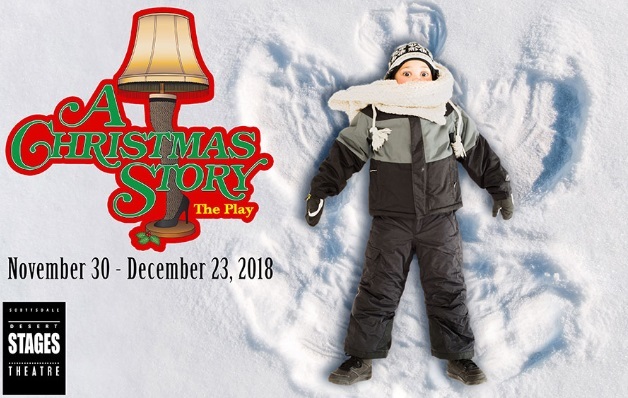 Performing now until December 23 at Scottsdale Desert Stages Theatre is the Philip Grecian adapted play of A Christmas Story, where Christmas, lovely, beautiful, glorious Christmas, is just around the corner, and young Ralphie Parker (Owen Brady) knows exactly what he wants. It’s the Red Ryder Carbine Action Range Model Air Rifle with a compass in the stock and a thing that tells the time. The problem is, Ralphie knows what his mother (Wendy Claus) is going to say. “You’ll shoot your eye out.” So the young boy’s challenge is clear. Somehow, he needs to convince his parents that the rifle with that thing that tells the time is exactly what he needs. And there are just a few weeks left in which to do it. What follows is a series of family misadventures consisting of younger brother Randy (Ronin Feldman) impersonating a pig in order to eat his food, Ralphie’s Old Man (Peter Cunniff) winning a ‘major award,’ the conflicts with the class bully, Scut Farkus (Bear Golden), the tongue on the school’s frozen pole affair with Schwarts (Xander Zeeb) and the hapless Flick (Luke Chakmakian), and a trip to Higbee’s department store for a quick word with the big guy himself. If anyone can get Ralphie his beloved rifle in time for Christmas, it’s Santa. And unlike the film, there’s even a hint of a love interest involving Helen Weathers’ (Ava Sandifer) best friend, Ester Jane Alberry (Ava Sandifer) who rescues Ralphie’s glasses just when he needs them the most. Like Theatre-in-the-Round where not every show lends itself for adaptation, not every play works as effectively when adapted for presentation in a small, intimate setting. Desert Stages’ Actor’s Cafe can be impressive when its production requires the one set, particularly here at the company’s new location in Scottsdale’s Fashion Center where Harkins Movie Theatres used to be, but when the story requires extra areas that the restrictive space can’t supply, no matter how creative or inventive director Rick Davis tries, he’s up against too much. When the schoolboys gather around the schoolyard pole, or when Miss Shields (Stephanie Vlasich) is handing out classroom assignments, no matter how the lighting design changes, things can’t help but look as though everything is occurring inside the Parker’s living room. Plus, when the Old Man talks outside in the street with the neighbors while admiring the prize he won, the whole scene is played as voices-off with Mother left alone on stage by the window while trying to react and show how mortified she is at the tasteless thing in the living room window. The same thing occurs when Ralphie and Randy visit Higbees; we never see the department store Santa, it’s all played off-stage in voice-over. What works, however, is Scot Claus’ narrator. As a radio presenter and commentator, author Jean Shepherd had a unique style and a distinctive voice. In the play, that same style is used, only instead of just hearing the narrator, here you see him. Claus plays Ralph as a grown man. In that nostalgic way of looking back, the storyteller enters and talks directly to us. He’s his own Ghost of Christmas Past, wandering among the characters as though they’re visions of things that have already happened. As written in Grecian’s adaptation, the narration usually comes across as heavy-handed, more like a lengthy monolog with support from a cast acting out some of the things the narrator is telling us. But in this production, that’s exactly what’s needed. Like Shepherd’s radio work, Claus, with his enthusiastic, animated delivery under Davis’s guidance, creates a theatre of the mind. It’s this production’s greatest strength. Even if our suspension of disbelief can’t always be done when characters walk across the Parker’s living room without successfully suggesting they’re elsewhere, Claus conjures images of life and how it used to be with words. He’s not only the center of the play, he’s the single element that holds the whole production together.